Establishing a child’s paternity is important for many reasons. It ensures the child can foster and build a relationship with both his or her parents. A child deserves all the advantages that two parents can provide. Maryland has adopted the Uniform Parentage Act (UPA), which invalidates many of the antiquated laws that previously placed children born to unmarried parents at a disadvantage. Seeking counsel from a paternity actions attorney is important to help establish paternity of your child. An attorney can help guide you legally through this sensitive but vital process. Indeed, this is a central element for protecting your child’s current and future wellbeing. Makes it easier for the child to learn about his father’s medical history and receive benefits from the father’s medical insurance. Either the mother or alleged father can file a paternity action. Paternity can be established through an Affidavit of Parentage form or through a court order. Completing the affidavit is completely voluntary and can be used to establish paternity up until the child’s 18th birthday. You may consult with a family attorney before signing the form and should consult an attorney and not sign the form if you are not certain you are the biological father. Once the affidavit is signed it is a legal finding of paternity. A person who signed the affidavit may cancel the form within 60 days of signing the affidavit. If the alleged father does not sign the affidavit he is not absolved from fulfilling his financial obligations for the child. 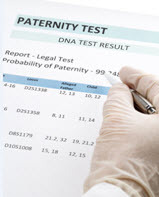 His paternity can be established through genetic testing and the court can order the testing if the father initially refused to submit to a genetic test. The Law Offices of Todd K. Mohink, PA represent both fathers and mothers in paternity actions, whether they are seeking or contesting paternity. Mothers can file a paternity suit to establish child support and an unmarried father can also file to establish his parental rights. Our experienced family law attorneys have also filed paternity suits for men who have been wrongfully named as the father. Contact our Glen Burnie or Columbia child custody lawyers to file a paternity action. We will respect your privacy surrounding this delicate matter and protect your rights throughout your paternity action.